Oh, Dawn, one of those Boulder Birdbaths by Stone Age Creations would be perfect at the Shack. Definitely complimentary to the woods and natural surroundings. Cardinals are beautiful birds. I always enjoy seeing that flash of red in my backyard. 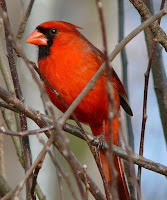 Interesting facts about what attracts Cardinals. And I agree with what Mouse said about the Stone Age Creations birdbaths - they look perfect for the WV Shack setting. I too love to see the Cardinals in my yard. One of the best things that I ever purchased was the platform feeder. The Cardinals love it but so do the other birds, too. There is always something colorful on it. Oh Dawn, I'm sure you have them deep in your woods, but bringing food that they like closer to where you can enjoy them will help for sure. Cardinals are a very nice bird to watch and their song isn't too hard to mimic. I call mine all time and they do answer. Love the birdbath you have your eyes on! Wowser!